Saving Seeds – A Fun Fall Activity! Fall has arrived, and that means it’s seed saving time! Saving seeds is a long standing tradition, and part of the reason we still have delicious treats like Heirloom Tomatoes! 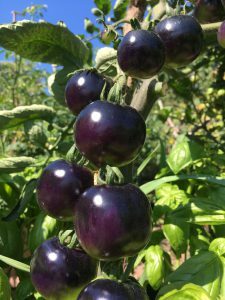 Look at these gorgeous Indigo Rose tomatoes! To save some seeds is simpler than others. For some all you need to do it wait for the right ripeness and then gather into paper bags. Herbs like cilantro and fennel are perfect for this. If you leave a few plants to go to seed, just wait until the seeds dry on the stem. Then all you have to do is place a paper bag around the top of the plant, then gently release the dried seeds into the bag. Fold over the top of the bag and store in a cool, dry place. Remember to label the bag! Some seeds like tomatoes and cucumbers are a bit fussier, but perhaps even more satisfying in the end! Any seed that is covered in a slimy film needs a bit of work to dry and save. Choose a tomato that you’d like to save the seeds from and scoop out the seeds. Place the seeds in a small jar and cover with water. Cover the jar and let sit for about 3-7 days, until a thin mold forms on the top of the slurry. Pour off the mold and rinse the seeds well until the water is clear. The seeds should now be free from their outer coating! Now, simply place the seeds on a sheet of tin foil and allow to air dry. You will want to make sure none of the seeds are stuck together when they are drying or they may mold. Once the seeds are completely dry (5-14 days depending on the humidity in your home), just fold them up in the tin foil and be sure to label them. Store in a cool dry place and they’ll be ready for next year! Most tomato seeds will stay viable for about 5 years, but germination rates will decrease each year. Watch this short video for a slightly modified version – and a fun British accent!